The Monkees (Davy Jones, Mickey Dolenz, Peter Tork, and Mike Nesmith) brought rock’n’roll to TV with their mega-successful 1966-68 musical sitcom. 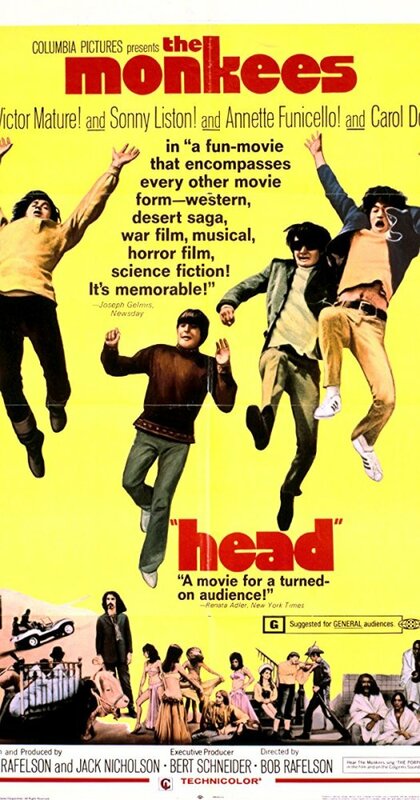 Inspired by The Beatles’ onscreen antics in A HARD DAY’S NIGHT and HELP!, producers Bob Rafelson and Bert Schneider cast four fresh-faced youths (Jones was a Tony nominee for OLIVER!, Dolenz had starred in TV’s CIRCUS BOY, Tork and Nesmith were vets of the folk-rock scene), hired some of the era’s top songwriters (Gerry Goffin & Carole King, Tommy Boyce & Bobby Hart, Neil Diamond, Harry Nilsson) and session musicians (Hal Blaine, James Burton, Glen Campbell , Carol Kaye), and Monkeemania became a full-fledged teenybop pop phenomenon. This entry was posted in Film, Film Review, Music and tagged Bert Schneider, Bob Rafelson, Columbia Pictures, Cracked Rear Viewer, Davy Jones, Gary Loggins, Head, Mickey Dolenz, Mike Nesmith, Peter Tork, rock and roll, Rockin' in the Film World, The Monkees, Through the Shattered Lens. Bookmark the permalink.